It was a pleasure getting to know you and sharing stories. 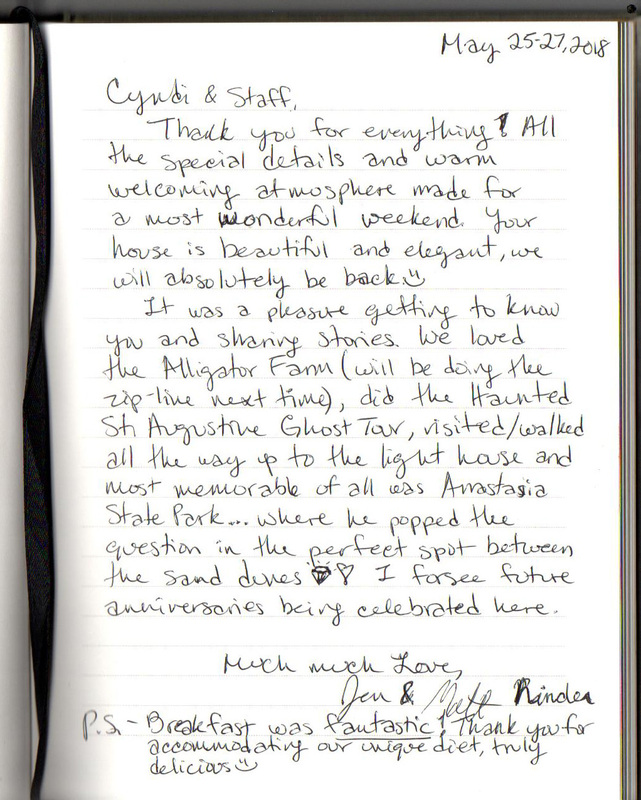 We loved The Alligator Farm (will be doing the zip-line next time) and the Haunted St. Augustine Ghost Tour, visited/walked all the way up to the light house and more memorable of all was Anastasia State Park…where he popped the question in the perfect spot between the sand dunes. I foresee future anniversaries being celebrated there. Live Music All Summer In St. Augustine! There’s also the Anastasia Park Summer Concert Series, and performances all over the city at cafes and clubs. Music lovers will have no problem finding something to suit their tastes while visiting. This is our first B&B in FL (too many to count in Bar Harbor, Maine); Bravo to you all! This is a first rate quality property. Well preserved and updated for comfort and relaxing. The breakfasts are food art pieces in themselves, self win service and the porches are another unique touch. The restaurant suggestions of Collage and Perserve were both 5 stars; and the central location of Cedar House was perfect, never took the car out once. Two highlights that we cannot miss mentioning are the front porch and your World Series Ring, what a treat for real Red Sox fans like us. Cedar House Guests Michele and Bill Hunter in town to celebrate their 25th Anniversary at Cedar House Inn. What makes this extra special…Every 5 years Michele wears her original wedding gown in an exceptional setting to commemorate their special day. This year they walked into breakfast and received a round of applause from our guests then made their way to the garden to “Lock their Love” on our Love-Lock garden bench. Congratulations Michele and Bill and thank you for sharing your amazing tradition! We love helping our guests celebrate anniversaries! The Cedar House Inn is getting some extra national notoriety this week from BedAndBreakfast.com! We submitted an amazing Tiffany Katz Photography capture of one of our most popular breakfast dishes and it was selected as a finalist in their 2018 Breakfast Tourney. It’s probably not a surprise to you if you’ve entered our dining nook to the sight & smell of our Ham & Cheese Souffle Truffle Roasted Potatoes with Dijon Hollandaise. Congratulations Open Gates Bed & Breakfast in Darien Georgia! It was our pleasure to be Michigan to their Villa Nova! Thank you as well to the friends and guests who voted for us in the BedandBreakfast.com breakfast tourney! Here’s some news for you: this has inspired a new amenity at Cedar House. Our guests have encouraged us to serve dinner at the inn for years so, beginning in September 2018, we will host occasional Pop-Up Dinners paired with local wine and distilled spirits! We’ll provide more info soon and you can start planning your next #StAugustine Adventure. Until then, thanks to all that helped us make the finals! Trip Advisor Again Names Cedar House #1 Bed & Breakfast! Imagine our surprise when we received the news that Trip Advisor, The World’s Largest Travel Site, has once again recognized St. Augustine’s Cedar House Inn as the overall US winner in the Bed & Breakfast category in the 2018 TripAdvisor Travelers’ Choice® awards for Hotels. Travelers’ Choice award winners were determined based on the millions of reviews and opinions collected in a single year from TripAdvisor travelers worldwide. That means that you, our valued friend and guest, is at least partly responsible for this honor if you’ve ever shared your opinion of your Cedar House experience with fellow travelers. I also owe a great deal of gratitude to my incredible staff, who have been mindful of your every comfort during your stay. “This year’s Travelers’ Choice awards for Hotels recognize thousands of exceptional accommodations that received the highest marks for overall experience, including service, amenities and value, from travelers worldwide,” said Brooke Ferencsik, senior director of communications. “The global TripAdvisor community informed this list of winners that will inspire and help travelers find the hotel that’s right for them as they plan and book their next amazing trip.” In the 16th year of the awards, TripAdvisor has recognized 8,095 properties in 94 countries and eight regions worldwide. For the complete list of Travelers’ Choice Hotel award-winners for 2018, as well as the latest reviews and candid traveler photos, visit TripAdvisor.com/TravelersChoice-Hotels. Travelers can also follow the conversation on Twitter at #TravelersChoice. Thank you to all that joined us at Cedar House Inn for the St Augustine Historic Inns Holiday Bed & Breakfast Tour! We hope that you enjoyed our Doubloon Give Away and want to congratulate the 5 Winners who picked the coins with the special PURPLE dots! They’ll all receive a complimentary one night mid-week stay at Cedar House Inn. But wait…there’s more! We want EVERYONE to be a winner! Hang on to your doubloon for a 20% discount on any reservation made in July – September 2018 (excluding holidays). Use Promo Code 1210 now at www.cedarhouseinn.com (offer expires Jan. 1, 2018). Congratulations to all of our attendees! One doubloon reservation per couple will be accepted, please contact Cyndi at (904) 829-0079 for additional reservation information. Wishing everyone a warm and wonderful holiday season and a prosperous New Year!